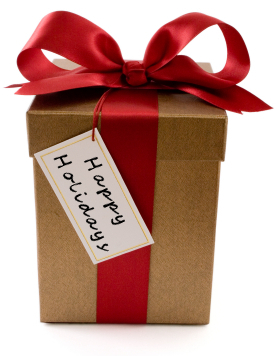 Check out these fun and healthy gift ideas! Make them for your family, friends, and colleagues, or help your customers do the same! Combine a gift of health with another gift to match! That way you’ll give someone you love a health boost that keeps on giving. *Performance Sports Drink (Orange or Lemon-Lime), 180 Snack Bars, and Joint & Muscle Pain Cream along with a sports bottle, football, soccer ball, a signed ball or signed photograph. *180 Snack Crisps (Sea Salt or Barbecue or both) in a basket circled with ribbon along with some movies or a subscription to NetFlix, etc. *Basic-H2 with a sponge in a bucket filled with car magazines. Add Scour Off Paste for the tires and tough spots. *ENFUSELLE Sun Screen, Performance Sports Drink (Orange or Lemon-Lime), and ENERGY CHEWS with golf stuff, ball, gym bag, etc. *180 Meal Bars with brochures for hiking trails, bike routes, fishing holes, etc. *ENFUSELLE Anti-Aging Skin Care collection with a lighted makeup mirror. *Cocoa Meal Shake or 180 Chocolate Shake Mix Canister or Packets for healthy hot chocolate snacks along with a warm hat, scarf, and gloves. *Herbal Blend Multi-Purpose Cream with some nice slippers and/or cute designer sox. Include a note about how the cream soothes sore tootsies year round. You can even refrigerate it to cool feet in summer. *MB Cleansing Bar and Hand & Body Lotion wrapped with a pretty ceramic soap dish and colorful bath accessories. *ENFUSELLE Infusing Mineral Masque and Skin Polisher with a silky robe, one in each pocket. *ENFUSELLE C+E Repair in a chic black matte cosmetic clutch with a designer mirror. *ENFUSELLE AM Repair with a beautiful scarf in a gold organza bag. *Cocoa Energizing Soy Protein with the recipe for cocoa soy-peanut butter “energy balls” and a festive container full of them. Or Instant Protein with a container of fruit or chocolate dessert bars made with it and the recipes. *Travel Bag filled with ENFUSELLE Products along with travel magazines and/or a video of a fun destination. *Chewable C and/or ENERGY CHEWS in a beautiful candy dish wrapped with a big bow. *Instant Protein Soy Mix with pumpkin bread or cranberry/orange bread you’ve made, using it as an ingredient, along with the recipe. *180 Tea with a cute teapot and tea cozy or 180 Vanilla Chai with cool coffee mugs. *MB Cleansing Bar sewn into satin material and decorated as a drawer sachet, or wrapped in a pretty handkerchief tied with a velvet ribbon. *Joint & Muscle Pain Cream with a tag wishing them many nights of perfect sleep! *Toffee & Chocolate Crunch Snack Bar wrapped with a ribbon. *New Concept Dentifrice with a cute toothbrush in the paw of a stuffed animal. *MIGHTY SMART “Smart Candy” with books and fun pens for a grade schooler. *Vita-Lea, Meal Shake and a SHAKLEE Shaker with a fun wake-up alarm clock. *ENFUSELLE Shower Gel, ENFUSELLE Hand & Body Lotion, and Bath Sponge in a pretty shower caddy or with a set of monogrammed towels. *Chewy Apple Cinnamon Bars with some polished apples in a festive box or basket. *Joint & Muscle Pain Relief Cream with a microwaveable comfort pillow. *180 Tea with a cookbook of decadent gluten-free desserts. *ENFUSELLE Firming Serum with a pretty scarf, or jewelry, or designer shades. *180 Snack Crisps (Sea Salt or Barbecue or both) in a basket circled with ribbon along with gourmet soup makings and a cookbook. *Get Clean Pitcher (possibly with a year’s supply of filters) with a set of fashionable drinking glasses, ice trays, fresh lemons. *CorEnergy and B-Complex with boxes of various kinds of teas and a mug. *Instant Protein Soy Mix with recipes for fish batter, muffins, etc. *Instant Protein Soy Mix with recipes and colorful baking pans and utensils. *Menopause Balance Complex with a box of chocolates. *A bottle of VIVIX with a bow and a nice calendar with a message about having a “youthful” year. *Vitalizer with a picture of the kids or grandkids or great grandkids. And add ENERGY CHEWS with a gift of gym membership. *Herbal Blend Multi-Purpose Cream with some nice slippers. Include a note about how the cream soothes sore tootsies year round–refrigerate it to cool in summer. *NUTRIFERON with ear muffs and HAND & BODY LOTION. *Stress Relief Complex with tickets to something fun for “stress relief” or add VITALIZER with a map and a shaving kit or cosmetic bag for traveling. *EZGEST and Stomach Soothing Complex with a coupon for a supply of ice cream for someone who usually can’t eat it…or with a coupon for dinner out at a restaurant known for 4 Alarm chili, or Mexican food, or spicy Indian cuisine, etc. *SHAKLEE Sun Screen SPF 30 with sun hat, ball cap, sunglasses, or picnic basket. *180 Turnaround Kit or Lean & Healthy Kit to start the new year right, along with a funky calendar, and a coupon for a shopping spree for clothes in 90 days. *Ultra Moisturizing Shea Butter Cream with gift of a massage. *Fresh Laundry Concentrate & Soft Fabric Concentrate with some luxurious towels. *Performance with gardening things like a hat, cotton gloves, and/or kneeling pad. You could add Joint & Muscle Pain Cream, and Basic-H2 as a safe bug repellant, an invisible glove, as fertilizer, and more. *PHYSIQUE Recovery Drink and Joint Health Complex with a jump rope or exercise DVD for someone making new year resolutions. *ProSanté Hair Care System with a really nice brush and hair things, along with info about how hair will stop falling out. *SHAKLEE First Aid Kit or SHAKLEE “Non-Medicine” Cabinet in a pretty basket. Choose any combination of the following…or the Packages below. A COLDS & FLU PACKAGE (about $239) Alfalfa, Defend & Resist, Extra Vita-Lea without Iron, Garlic, GERM OFF Wipes, Liqui-Lea, Optiflora Pro-biotic, Performance Lemon Lime, Performance Orange, Vita-C Chewable, Vita-C Tablet, Vitamin D3, Zinc. Thank you to fellow Shaklee Master Coordinator, Maureen Shaw, for sharing this list.